In Savills latest ‘Commercial Outlook – Six Trends for 2019,’ it reveals that London was one of the most popular destinations for cross-border commercial property investment between 2016 and 2018. It adds that customer experience is the driving factor and landlords who look after their tenants are thriving, in relation to both short-term or long-term rentals. Given the difficulties experienced by the retail sector, Savills expects landlords in the sector to attempt to mix their portfolios and offer additional services to tenants. London property remains the most exposed to Brexit, but demand for office space has contradicted this, as there remains only one year’s supply available in the West End and the City. 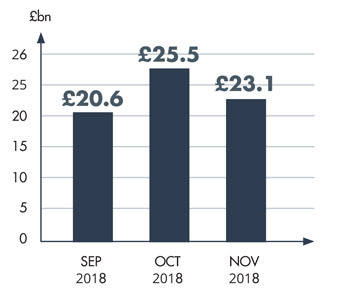 Of the £20bn of investment into the London commercial property market during 2018, 90% came from overseas buyers, defying fears that the protracted Brexit deliberations would dampen the market. Prime examples of this include the £1.2bn sale of Goldman Sachs’ new London HQ to South Korea’s national pension fund and the £1bn purchase of 5 Broadgate by CK Asset Holdings Ltd. Other examples are the purchase of the Adelphi building in the West End by Amancio Ortega, the Spanish fashion tycoon, for £550m. Home grown investors were also active; Landsec, the largest commercial property development and investment company in the UK, acquired Lavington House in Southwark for £87m. Pre-lets (where businesses agree to occupy a building prior to its construction) have also boomed, with both Sony and Facebook entering agreements in Kings Cross and Paddington respectively. The retail sector has endured a poor Christmas season, adding to its already declining footfall. Consequently, landlords fear the worst as major retail chains battle to maintain their sales margins, just as those landlords attempt to maintain the rental values of prime retail sites they own. With the continuing decline in bricks and mortar retail sales, store owners are starting to demand that landlords reduce rents to alleviate their pain when leases expire, or even before, by entering into a CVA or Corporate Voluntary Agreement to achieve this. From their perspective, landlords are reluctant to reduce rents, instead preferring to acquire new tenants. Landlords currently find themselves in a strong position with powerful allies, in the shape of local and central government. As business rates are calculated based on rental values, it pays ministers and councillors to support higher rents. House prices in London fell by 0.7% in the year to November 2018. London house prices have been falling over the year each month since July 2018.